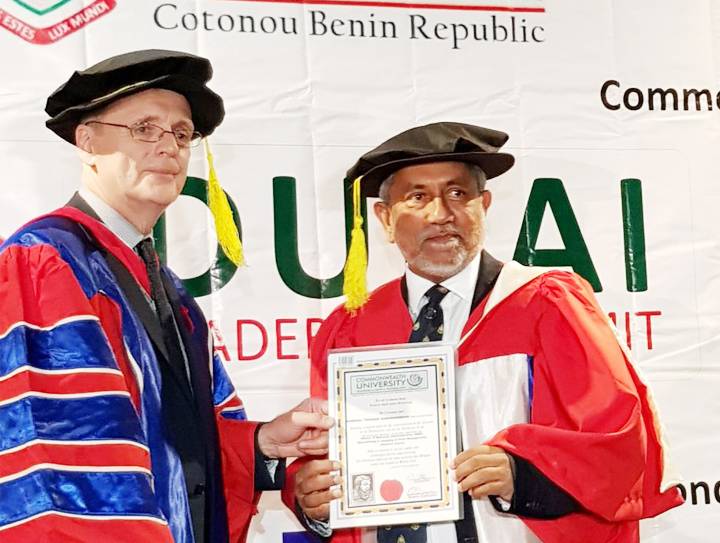 Senior Consultant of CINEC Campus, Admiral Thisara Samarasinghe was awarded the Honorary Doctorate Degree – Doctor of Business Administration (DBA) Specializing in Shipping and Port Management by the Commonwealth University in the UK, at a Top Executive Seminar organized by the London Graduate School, held from 4th to 6th of April in Dubai. This award is in recognition of his exceptional meritorious service to Sri Lanka with distinction throughout his career in the Navy, and later as the Commander of the Navy. Furthermore, recognizing his outstanding leadership as High Commissioner to Australia where he ensured significant improvement in Bi lateral relationships with Australia.